Built on the same action and barrels as more-expensive guns, the 40E requires less handwork in its engraving and stocking. Photographs Courtesy of Merkel USA. For its shotguns, German gunmaker Merkel is perhaps best known for its Kersten-crossbolted over/unders (Gun Review, March/April ’05), though the company always has made marvelous side-by-sides as well. The problem with marvelous guns is that they are often marvelously pricey: The Model 147 EL side-by-side boxlock, with its nice wood and full-coverage engraving, is currently more than $8,000. In spite of the legendary Merkel quality, that’s a goodly amount to spend for a working field gun. That’s why Merkel recently introduced its first new model in 10 years. The less-adorned Model 40E side-by-side boxlock replaces the case-colored 47E. The 40E’s introductory price is $3,999, with the regular price to be $4,595 down the road. That’s roughly half the price of the mechanically identical but cosmetically enhanced 147 EL. Let’s see what you get for $4,000 less. The 40E comes in 12, 20 and 28 gauge, with 16 expected soon. Our review gun was a 20 in a classic upland configuration, with 28″ barrels (the only length offered at the moment), double triggers and an English stock. The 40E’s action will be familiar to anyone who has handled a Merkel side-by-side boxlock in the past 20 years. The first thing you always notice with a Merkel side-by-side is the Greener crossbolt protruding from the top left of the receiver when the gun is open. The crossbolt engages the piercing through the barrel extension, which tucks down into a slot in the top of the receiver. All is perfectly smooth when the gun is closed. While the crossbolt is probably enough to securely lock the gun, things don’t stop there. In addition to the crossbolt, the 40E has traditional Purdey, dual-underlug bolting to complete the suspenders-and-belt approach. This is why Merkel has the reputation for building such sturdy guns. That said, this gun does not have the reinforcing sideclips so often seen on Merkel side-by-sides. That would be suspenders and two belts. Merkel describes the 40E action as an Anson & Deeley boxlock. It certainly isn’t the Blitz triggerplate action often seen in other German guns, but it doesn’t look like the traditional English A&D either. The outside lacks the three telltale crosspin ends exposed on each side of the receiver that secure the cocking levers, tumblers and sears. That’s all handled internally. The entire bottom of the receiver is removable for access. The face of the receiver shows that the firing pins are disk-set for easy access without receiver disassembly. The mainsprings are leaf, not coil. Modern steel leaf springs are exceptionally durable and maintain all of their force throughout their lives. Coil springs weaken slightly each time they are released. This action’s reputation for long life and strength is impeccable in previous mechanically identical Merkel models. 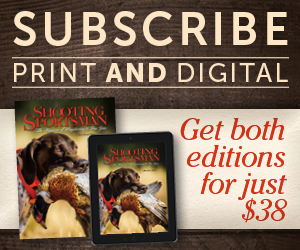 The 12- and 20-gauge 40Es are available with double or single-selective triggers. 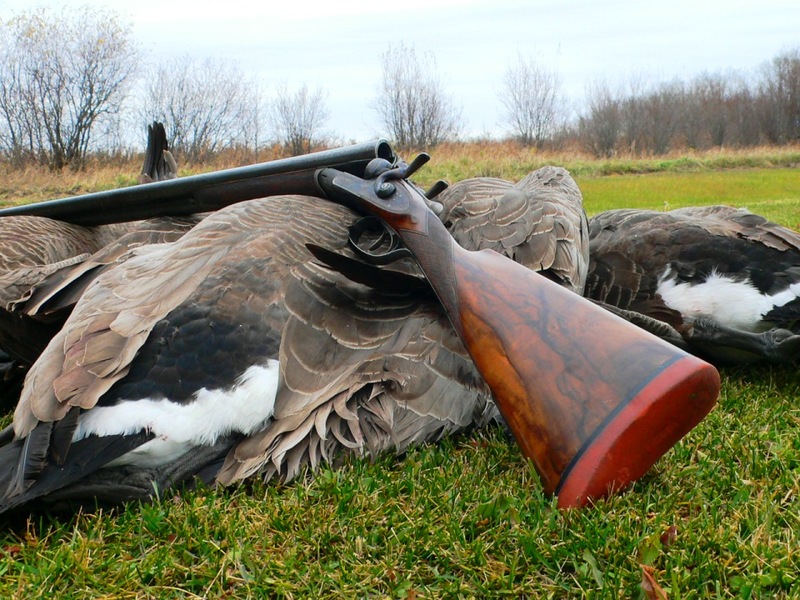 The single trigger on the 28, built on a 20-gauge frame, is non-selective. Our test gun’s trigger pulls measured an average of 3¾ pounds in front and 3½ pounds in back. Both had the tiniest bit of take-up, but then were quite crisp. You expect good triggers from Merkel. The firm makes a lot of rifles and knows triggers. The top tang safety is nicely shaped and engraved, to ensure positive action, even with gloves. The safety is automatic, engaging each time the action is opened. 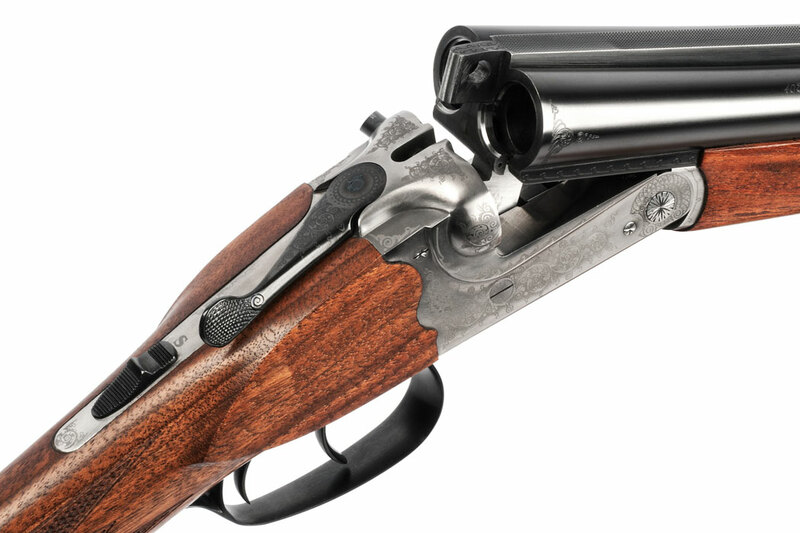 The hinge pin, on which the barrels pivot, is replaceable, if tightening the gun is necessary. Considering the robustness of the action, this may not be necessary for a long time, but it is still nice to know. The ejectors use the tried-and-true Southgate system, which dates to 1893. It’s still the best system for a side-by-side. The ejector tumblers and leaf springs are located in the forend iron and are actuated by hammer fall. Merkel clearly is trying to make its guns more affordable and do it the right way. The Merkel action always gets a lot of attention because of its third fastener and reputation for strength, but Merkel barrels are even more famous. Unlike many gunmakers, Merkel makes its barrels in-house. The barrels are among the best, and a number of other companies buy their barrels from Merkel. The tubes are cold-hammer-forged, a process developed in Germany in 1939 and applied with modern machinery today. It is important to remember that, in addition to O/Us and side-by-sides, Merkel makes a wide assortment of excellent rifles, ranging from single-shots and bolt-actions to double rifles and Drillings. Some of these barrels require a great deal of precision in manufacturing, and that carries over to the company’s shotgun barrels. Our 40E 20-gauge barrels were proofed for steel and had 3″ chambers with relatively abrupt forcing cones. The bores were both .630″. That’s .015″ over the nominal .615″ 20-bore, reflecting a fair amount of overbore. The fixed chokes were .010″ in the right barrel and .020″ in the left. The designations stamped on the barrels were Improved Cylinder and Modified. Like the chamber forcing cones, the choke tapers were fairly short. Screw chokes are not available from Merkel on this gun, but Briley will oblige you with aftermarket Thinwalls if you like. The barrels are joined at the rear by shoe, or platform, lumps. Shoe lumps use a bottom plate on top of which the barrel tubes are silver soldered or brazed. Shoe lumps result in a slightly wider breech than chopper lumps due to the way the barrels are joined. The two lumps that comprise the hinge axis and engage the sliding Purdey underbolt lock are machined integrally as part of the shoe-lump plate. Along their length the barrels are joined by a conventional soldered rib on the bottom and a solid raised rib with a flat upper surface on the top. This top rib is common on American, Italian and German side-by-sides, whereas a lower concave rib is traditionally British and often used by the Spanish. If you use the rib for a bit of peripheral sighting, the Merkel rib is functional. If you ignore ribs completely and concentrate only on the bird, a concave rib stays out of the way and is always more graceful. The 40E’s rib is tapered, and it is machined on top to reduce glare. Up front there is a proper single small brass bead. The wood on the 40E held no surprises. One of the ways Merkel has kept the price low is to furnish the 40E with plain walnut. The gun is available with an English or rounded-pistol-grip field stock. Our English-stocked sample had a length of pull of 143⁄8″, with a drop at comb of 13⁄8″, drop at heel of 23⁄8″, a little right-hand cast and the usual 4° pitch. Custom dimensions are not available on this model. There is a serviceable black plastic buttplate on the back of the stock. Checkering is machine cut in a standard yet attractive pattern. The checkering was coarse enough to provide a decent grip but fine enough for a good appearance. As a classy addition, the stock sported a trigger-guard tang fully six inches long. It was held in place by two indexed and engraved screws and was inletted flush to the wood. Unfortunately, that was the only really good wood-to-metal fit on the gun. The wood at the stock head and rear of the forend was quite proud, while the inletting of the forend-latch iron had the metal slightly below the wood. It looked as though handfitting of the wood was skipped to keep the price down. The finishing of the wood was also pretty basic. As is the custom with many European gunmakers, the walnut grain was left open, with the wood pores unfilled. 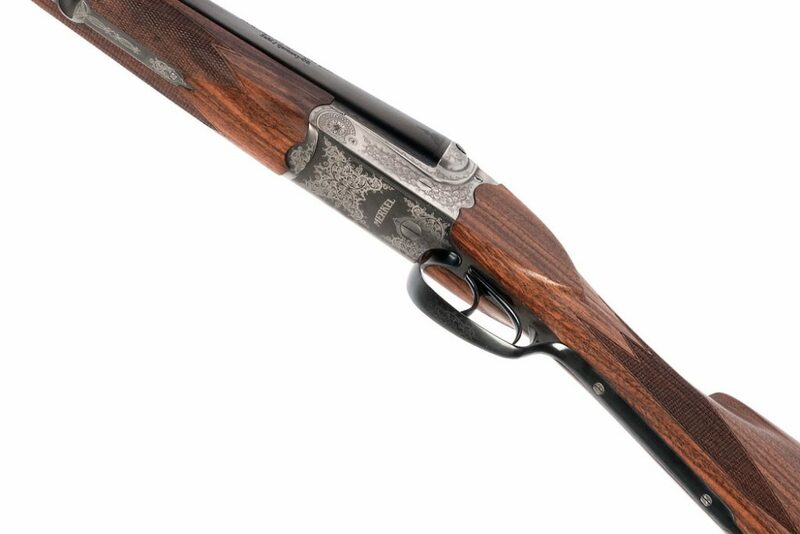 The Merkel website states that the gun has a “single oil-and-sand finish.” On the plus side, it will be easy to repair the usual hunting scratches with a little Tru-Oil. The forend is something between the classic English splinter and a modest beavertail. Because of the use of a Deeley latch instead of the usual Anson pushbutton seen on most side-by-sides, the forend is longer, deeper and has a blunter nose than is usual. But it does allow a more forward hand placement, while its size gives a slightly better grip. A little grace has been sacrificed for practicality. The cosmetics of the gun, not the mechanics, are where Merkel has saved money compared to its upscale 147 EL. The mechanics of our 40E were first class. In addition to the plain and not particularly well-fitted wood, the 40E’s receiver engraving is sure to attract your attention. It is so-so light laser scroll on a silver-nitrate finish. General opinion among those I showed it to was “meh.” On the other side of the coin, the physical lines of the 40E’s receiver are most attractive. The rear of the receiver is very nicely sculpted, to avoid the harsh straight line of so many A&Ds, and there is the classic Merkel sculpted “swoosh” along the water table and up the rear. Our 40E was shipped in a cardboard box along with its certificate of proof and an extremely basic manual. The factory warranty is for one year, and it is not transferable. The gun felt slightly heavier to me than its 6-pound 5.4-ounce weight, which is certainly about right for a 20-gauge side-by-side. The balance point was just at the front of the hinge. The gun was quick enough to point, but the heavier feel added steadiness on longer shots that is so often missing in sub-gauge guns. Barrel convergence was correct, as you would expect from a company that makes its own barrels and can regulate double rifles. Mechanically, the gun was correct in all respects. The triggers were crisp and excellent, allowing perfect timing on more distant targets. The auto safety was just right in terms of feel and resistance. The ejectors did their job without wounding passers-by. The stock dimensions seemed to fit compact shooters better than lanky ones, but everyone adapted well. The gun was definitely easy to shoot. All those who tried it praised its handling. The plastic buttplate was most welcome, as it smoothly slid up to the shoulder without snagging and grabbing. So is the Merkel 40E worth $4,000? I think so. Merkel clearly is trying to make its guns more affordable and do it the right way. The savings are in the cosmetics versus the important stuff. Merkel’s mechanics are absolutely first class, its barrels are excellent and its guns are seriously durable. Besides, when that grouse surprises you and you trip over a root, the dings and scratches won’t break your heart. You’ll soon forget about them. What you won’t forget is the quality of the metal and mechanics on these excellent German guns.